Avesil Review: Is it Safe? 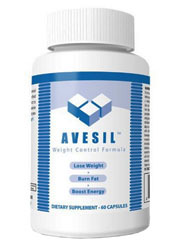 Avesil is a dietary supplement that claims to give its users fast and safe weight loss by reducing appetite, burning fat fast and boosting energy. It comes in a blue labeled white package, with 60 capsules per bottle. The product is offered in other places aside from their main website. They even tell you that you can try the product at no cost aside from the shipping and handling fee. Does this sound just too good to be true? That's because our researchers found out that it is. Avesil is a dietary supplement that claims to offer a lot of great things, but in reality it all comes with a price. The pills almost remind us of other products that we have used with hidden fees that are not explicitly mentioned at first, but always hurt our readers in the end. Speaking of fees, this product has quite the fee of $89.95 per monthly bottle. That does not even include shipping and handling! That will cost you at least another $5.95 putting the total cost of this product at $95.90! The company does offer a "free trial membership" (where the customer only pays shipping and handling) for a month's supply. However, the free trial only lasts 14 days and if you do not forget to cancel the trial membership you will automatically be charged a membership price of $89.95! To top that all off, if you do not cancel the membership they will keep charging your account $95.90 every month until you do cancel. Some customers have reported having mild success with this product. Avesil uses unnatural ingredients which may cause liver problems, nausea, jaundice, the shakes, and headaches; price is very high. Understandably, you could be thinking that if it works then it's worth it. We caution our readers to think twice about this and look at the ingredients (which, by the way, are no where near 100% all natural). The main ingredient in Avesil is Chromium, followed by Caffeine, Green tea Leaf Extract, and Ashwagandha (root) Extract. These ingredients may help to cause weight loss, but they may also help to cause a whole host of unwanted side effects for our readers. For instance, Chromium can also cause liver problems, nausea, and jaundice. Caffeine, potentially, could lead to headaches, the shakes, and the inability to sleep when needed. This is especially true in high dosages. To make matters worse the company even openly admits that the caffeine dosage will make its customers "jittery" in the Frequently Asked Questions section of their website! The product had good reviews on their own website, but really strong negative reviews on more credible sites. Many people feel that the pills are a scam and that they are worth skipping. The ingredients found in Avesil are indeed all natural, but the fact that many are linked to caffeine means that side effects such as insomnia, stomach issues, and headaches are possible. We think it best that you steer clear of all caffeine-based supplements.